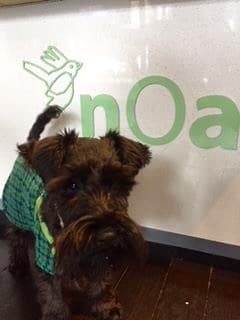 If you’re looking for a vet that focuses on your pet’s comfort, health and general wellbeing, then nOah is the place for you. Our holistic approach to your pet’s health has lead us to the creation of a facility that will make you and your pet feel at home, making visits to the vet seamlessly stress-free. During our time providing vet services to the Alphington region, we have become known as the most genuine and caring veterinary professionals in the area. Our veterinary clinic has been specifically designed to cater to the needs of your pets. A key feature is our separate waiting, consultation and hospital rooms for dogs and cats. Not only can dogs and cats create anxiety in each other they also have different environmental needs. Having separate spaces allows us to create the perfect veterinary environment for dogs and cats. So the cats can enjoy private spaces for their carriers to be stored in and dogs can enjoy a more open space that allows them to interact and play, or wait quietly in the corner, whichever suits them best. Our friendly and caring vet nurses will be on hand to make sure your appointment runs as smoothly as possible. This type of environment has proven to be incredibly successful in getting pets in the right frame of mind to be successfully examined and treated. Our Alphington veterinary services have been improving pet’s lives and putting smiles on owners faces by focusing on what makes pets happy. Whatever type of pet you have our skilled veterinarians, will conduct a thorough check-up and create a treatment plan that is tailored specifically to them. It’s all about making pets lives better so they can continue to provide all of the love and enjoyment that makes them such a vital part of any family. Our understanding of your pet’s needs is what makes nOah the best veterinary clinic in the vicinity of Alphington. Dog Vaccinations: Don’t gamble with your puppy’s health. Instead, get your dog down to nOah and ensure they’re getting the shots they need, each and every year. Cat Vaccinations: Your beloved kitten needs vaccinations to allow it to become a healthy cat. Our experts will get your kitten on schedule and provide you with reminders so that you never miss a shot. And just a short car ride from Alphington, your cat will be grateful you chose nOah. General / Routine check-ups: The best way to ensure your pet’s health is to take them on regular visits to the vet. Our pets can’t tell us if something doesn’t feel right so the only way to pick up on problems is to visit the experts at nOah vet. Dental Care: The health of your pet’s teeth is incredibly important to their overall health, so why not take advantage of our free dental checkups? Behavioural Consultations: If you’re worried about your pet’s behaviour, bring them along for a behavioural consultation and we’ll figure out a way to get your pet back to their best. Cat Boarding: If you’ve been putting off going on holiday because you don’t trust anyone with your cat, you’ve come to the right place. Our boarding facilities allow your cat to stay with us in absolute comfort. And with such a short journey from Alphington they will arrive non stressed and ready to settle in.